Petroleum (Latin Petroleum derived from Greek πέτρα (Latin petra) - rock + έλαιον (Latin oleum) - oil) or crude oil is a naturally occurring liquid found in formations in the Earth consisting of a complex mixture of hydrocarbons (mostly alkanes) of various lengths. The approximate length range is C5H12 to C18H38. Any shorter hydrocarbons are considered natural gas or natural gas liquids, while long-chain hydrocarbons are more viscous, and the longest chains are paraffin wax. In its naturally occurring form, it may contain other nonmetallic elements such as sulfur, oxygen, and nitrogen. It is usually black or dark brown (although it may be yellowish or even greenish) but varies greatly in appearance, depending on its composition. Crude oil may also be found in semi-solid form mixed with sand, as in the Athabasca oil sands in Canada, where it may be referred to as crude bitumen. Petroleum is used mostly, by volume, for producing fuel oil and gasoline (petrol), both important "primary energy" sources. In a typical barrel 84 percent (37 of 42 gallons) of the hydrocarbons present in petroleum is converted into energy-rich fuels (petroleum-based fuels), including gasoline, diesel, jet, heating, and other fuel oils, and liquefied petroleum gas. Due to its high energy density, easy transportability and relative abundance, it has become the world's most important source of energy since the mid-1950s. Petroleum is also the raw material for many chemical products, including solvents, fertilizers, pesticides, and plastics; the 16 percent not used for energy production is converted into these other materials. Petroleum is found in porous rock formations in the upper strata of some areas of the Earth's crust. There is also petroleum in oil sands. Known reserves of petroleum are typically estimated at around 1.2 trillion barrels without oil sands , or 3.74 trillion barrels with oil sands However, oil production from oil sands is currently severely limited. Consumption is currently around 84 million barrels per day, or 4.9 trillion liters per year. Because of reservoir engineering difficulties, recoverable oil reserves are significantly less than total oil-in-place. At current consumption levels, and assuming that oil will be consumed only from reservoirs, known reserves would be gone in about 32 years, around 2039, potentially leading to a global energy crisis. However, this ignores any new discoveries, changes in consumption, using oil sands, using synthetic petroleum, and other factors. 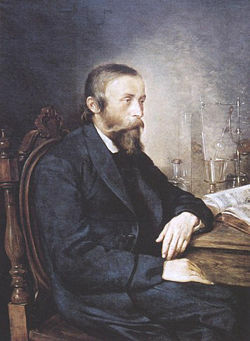 Ignacy Łukasiewicz - inventor of the refining of kerosene from crude oil. Formation of petroleum occurs in a variety of mostly endothermic reactions in high temperature and/or pressure. For example, a kerogen may break down into hydrocarbons of different lengths. Most geologists view crude oil and natural gas as the product of compression and heating of ancient organic materials over geological time. According to this theory, oil is formed from the preserved remains of prehistoric zooplankton and algae which have been settled to the sea (or lake) bottom in large quantities under anoxic conditions. Terrestrial plants, on the other hand, tend to form coal. Over geological time this organic matter, mixed with mud, is buried under heavy layers of sediment. The resulting high levels of heat and pressure cause the organic matter to chemically change during diagenesis, first into a waxy material known as kerogen which is found in various oil shales around the world, and then with more heat into liquid and gaseous hydrocarbons in a process known as catagenesis. Because most hydrocarbons are lighter than rock or water, these sometimes migrate upward through adjacent rock layers until they become trapped beneath impermeable rocks, within porous rocks called reservoirs. Concentration of hydrocarbons in a trap forms an oil field, from which the liquid can be extracted by drilling and pumping. Geologists often refer to an "oil window" which is the temperature range that oil forms in—below the minimum temperature oil remains trapped in the form of kerogen, and above the maximum temperature the oil is converted to natural gas through the process of thermal cracking. Though this happens at different depths in different locations around the world, a 'typical' depth for the oil window might be 4–6 km. Note that even if oil is formed at extreme depths, it may be trapped at much shallower depths, even if it is not formed there (the Athabasca Oil Sands is one example). Three conditions must be present for oil reservoirs to form: first, a source rock rich in organic material buried deep enough for subterranean heat to cook it into oil; second, a porous and permeable reservoir rock for it to accumulate in; and last a cap rock (seal) that prevents it from escaping to the surface. The vast majority of oil that has been produced by the earth has long ago escaped to the surface and been biodegraded by oil-eating bacteria. Oil companies are looking for the small fraction that has been trapped by this rare combination of circumstances. Oil sands are reservoirs of partially biodegraded oil still in the process of escaping, but contain so much migrating oil that, although most of it has escaped, vast amounts are still present - more than can be found in conventional oil reservoirs. On the other hand, oil shales are source rocks that have never been buried deep enough to convert their trapped kerogen into oil. "a way to extract and make great quantityes of pitch, tarr, and oyle out of a sort of stone." The latter set is regularly used in petrochemical plants and oil refineries. The idea of abiogenic petroleum origin was championed in the Western world by astronomer Thomas Gold based on thoughts from Russia, mainly on studies of Nikolai Kudryavtsev. The idea proposes that hydrocarbons of purely geological origin exist in the planet. Hydrocarbons are less dense than aqueous pore fluids, and are proposed to migrate upward through deep fracture networks. Thermophilic, rock-dwelling microbial life-forms are proposed to be in part responsible for the biomarkers found in petroleum. This theory is a minority opinion, especially amongst geologists; no oil companies are currently known to explore for oil based on this theory. The oil industry classifies "crude" by the location of its origin (e.g., "West Texas Intermediate, WTI" or "Brent") and often by its relative weight or viscosity ("light," "intermediate" or "heavy"); refiners may also refer to it as "sweet," which means it contains relatively little sulfur, or as "sour," which means it contains substantial amounts of sulfur and requires more refining in order to meet current product specifications. Each crude oil has unique molecular characteristics which are understood by the use of crude oil assay analysis in petroleum laboratories. Brent Crude, comprising 15 oils from fields in the Brent and Ninian systems in the East Shetland Basin of the North Sea. The oil is landed at Sullom Voe terminal in the Shetlands. Oil production from Europe, Africa and Middle Eastern oil flowing West tends to be priced off the price of this oil, which forms a benchmark. The OPEC Reference Basket, a weighted average of oil blends from various OPEC (The Organization of the Petroleum Exporting Countries) countries. 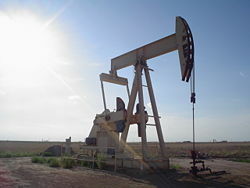 The most common method of obtaining petroleum is extracting it from oil wells found in oil fields. After the well has been located, various methods are used to recover the petroleum. Primary recovery methods are used to extract oil that is brought to the surface by underground pressure, and can generally recover about 20 percent of the oil present. After the oil pressure has depleted to the point that the oil is no longer brought to the surface, secondary recovery methods draw another 5 to 10 percent of the oil in the well to the surface. Finally, when secondary oil recovery methods are no longer viable, tertiary recovery methods reduce the viscosity of the oil in order to bring more to the surface. During the last oil price peak, other alternatives to producing oil gained importance. The best known such methods involve extracting oil from sources such as oil shale or tar sands. These resources are known to exist in large quantities; however, extracting the oil at low cost without negatively impacting the environment remains a challenge. It is also possible to transform natural gas or coal into oil (or, more precisely, the various hydrocarbons found in oil). The best-known such method is the Fischer-Tropsch process. It was a concept pioneered in Nazi Germany when imports of petroleum were restricted due to war and Germany found a method to extract oil from coal. It was known as Ersatz ("substitute" in German), and accounted for nearly half the total oil used in WWII by Germany. However, the process was used only as a last resort as naturally occurring oil was much cheaper. As crude oil prices increase, the cost of coal to oil conversion becomes comparatively cheaper. The method involves converting high ash coal into synthetic oil in a multi-stage process. Ideally, a ton of coal produces nearly 200 liters (1.25 bbl, 52 US gallons) of crude, with by-products ranging from tar to rare chemicals. Currently, two companies have commercialized their Fischer-Tropsch technology. Shell in Bintulu, Malaysia, uses natural gas as a feedstock, and produces primarily low-sulfur diesel fuels. Sasol in South Africa uses coal as a feedstock, and produces a variety of synthetic petroleum products. The process is today used in South Africa to produce most of the country's diesel fuel from coal by the company Sasol. The process was used in South Africa to meet its energy needs during its isolation under Apartheid. This process has received renewed attention in the quest to produce low sulfur diesel fuel in order to minimize the environmental impact from the use of diesel engines. An alternative method of converting coal into petroleum is the Karrick process, which was pioneered in the 1930s in the United States. It uses high temperatures in the absence of ambient air, to distill the short-chain hydrocarbons of petroleum out of coal. More recently explored is thermal depolymerization (TDP), a process for the reduction of complex organic materials into light crude oil. Using pressure and heat, long chain polymers of hydrogen, oxygen, and carbon decompose into short-chain petroleum hydrocarbons. This mimics the natural geological processes thought to be involved in the production of fossil fuels. In theory, TDP can convert any organic waste into petroleum. Petroleum, in some form or other, is not a substance new in the world's history. More than four thousand years ago, according to Herodotus and confirmed by Diodorus Siculus, asphalt was employed in the construction of the walls and towers of Babylon; there were oil pits near Ardericca (near Babylon), and a pitch spring on Zacynthus. Great quantities of it were found on the banks of the river Issus, one of the tributaries of the Euphrates. Ancient Persian tablets indicate the medicinal and lighting uses of petroleum in the upper levels of their society. The first oil wells were drilled in China in the fourth century or earlier. They had depths of up to 243 meters (about 800 feet) and were drilled using bits attached to bamboo poles. The oil was burned to evaporate brine and produce salt. By the tenth century, extensive bamboo pipelines connected oil wells with salt springs. The ancient records of China and Japan are said to contain many allusions to the use of natural gas for lighting and heating. Petroleum was known as burning water in Japan in the seventh century. The earliest mention of American petroleum occurs in Sir Walter Raleigh's account of the Trinidad Pitch Lake in 1595; whilst 37 years later, the account of a visit of a Franciscan, Joseph de la Roche d'Allion, to the oil springs of New York was published in Sagard's Histoire du Canada. A Russian traveller, Peter Kalm, in his work on America published in 1748 showed on a map the oil springs of Pennsylvania. The modern history of petroleum began in 1846 with the discovery of the process of refining kerosene from coal by Atlantic Canada's Abraham Pineo Gesner. The first modern oil well was drilled in 1745 in Pechelbronn, Alsace (France) under the direction of Louis de La Sablonniere, by special appointment of King Louis XV. The Pechelbronn oil field was alive until 1970, and was the birthplace of companies like Schlumberger. The first modern refinery was built there in 1857. Poland's Ignacy Łukasiewicz discovered a means of refining kerosene from the more readily available "rock oil" ("petr-oleum") in 1852 and the first rock oil mine was built in Bóbrka, near Krosno in southern Poland in the following year. These discoveries rapidly spread around the world, and Meerzoeff built the first Russian refinery in the mature oil fields at Baku in 1861. At that time Baku produced about 90 percent of the world's oil. Oil field in California, 1938. The first commercial oil well drilled in North America was in Oil Springs, Ontario, Canada in 1858, dug by James Miller Williams. The American petroleum industry began with Edwin Drake's drilling of a 69-foot-deep oil well in 1859, on Oil Creek near Titusville, Pennsylvania, for the Seneca Oil Company (originally yielding 25 barrels a day, by the end of the year output was at the rate of 15 barrels). The industry grew slowly in the 1800s, driven by the demand for kerosene and oil lamps. It became a major national concern in the early part of the twentieth century; the introduction of the internal combustion engine provided a demand that has largely sustained the industry to this day. Early "local" finds like those in Pennsylvania and Ontario were quickly exhausted, leading to "oil booms" in Texas, Oklahoma, and California. By 1910, significant oil fields had been discovered in Canada (specifically, in the province of Ontario), the Dutch East Indies (1885, in Sumatra), Iran (1908, in Masjed Soleiman), Peru, Venezuela, and Mexico, and were being developed at an industrial level. Even until the mid-1950s, coal was still the world's foremost fuel, but oil quickly took over. Following the 1973 energy crisis and the 1979 energy crisis, there was significant media coverage of oil supply levels. This brought to light the concern that oil is a limited resource that will eventually run out, at least as an economically viable energy source. At the time, the most common and popular predictions were always quite dire, and when they did not come true, many dismissed all such discussion. The future of petroleum as a fuel remains somewhat controversial. USA Today newspaper (2004) reports that there are 40 years of petroleum left in the ground. Some would argue that because the total amount of petroleum is finite, the dire predictions of the 1970s have merely been postponed. Others argue that technology will continue to allow for the production of cheap hydrocarbons and that the earth has vast sources of unconventional petroleum reserves in the form of tar sands, bitumen fields and oil shale that will allow for petroleum use to continue in the future, with both the Canadian tar sands and United States shale oil deposits representing potential reserves matching existing liquid petroleum deposits worldwide. Today, about 90 percent of vehicular fuel needs are met by oil. Petroleum also makes up 40 percenr of total energy consumption in the United States, but is responsible for only 2 percent of electricity generation. Petroleum's worth as a portable, dense energy source powering the vast majority of vehicles and as the base of many industrial chemicals makes it one of the world's most important commodities. Access to it was a major factor in several military conflicts including World War II and the Persian Gulf Wars of the late twentieth and early twenty-first centuries. The top three oil producing countries are Saudi Arabia, Russia, and the United States. About 80 percent of the world's readily accessible reserves are located in the Middle East, with 62.5 pervent coming from the Arab Five: Saudi Arabia (12.5 percent), UAE, Iraq, Qatar and Kuwait. However, with today's oil prices, Venezuela has larger reserves than Saudi Arabia due to crude reserves derived from bitumen. The chemical structure of petroleum is composed of hydrocarbon chains of different lengths. Because of this, petroleum may be taken to oil refineries and the hydrocarbon chemicals separated by distillation and treated by other chemical processes, to be used for a variety of purposes. See Petroleum products. Aromatic petrochemicals to be used as precursors in other chemical production. 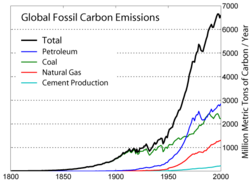 Global fossil carbon emissions, an indicator of consumption, for 1800-2000. Total is black. Oil is in blue. World energy consumption, 1980-2030. Source: International Energy Outlook 2006. The presence of oil has significant social and environmental impacts, from accidents and routine activities such as seismic exploration, drilling, and generation of polluting wastes not produced by other alternative energies. 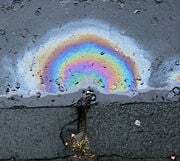 Oil extraction is costly and sometimes environmentally damaging, although Dr. John Hunt of the Woods Hole Oceanographic Institution pointed out in a 1981 paper that over 70 percent of the reserves in the world are associated with visible macroseepages, and many oil fields are found due to natural leaks. Offshore exploration and extraction of oil disturbs the surrounding marine environment. But at the same time, offshore oil platforms also form micro-habitats for marine creatures. Extraction may involve dredging, which stirs up the seabed, killing the sea plants that marine creatures need to survive. Crude oil and refined fuel spills from tanker ship accidents have damaged natural ecosystems in Alaska, the Galapagos Islands and many other places and times in Spain (i.e. Ibiza). alternative fuels used in standard or modified internal combustion engines (i.e. combustion hydrogen or biofuels). propulsion systems not based on internal combustion, such as those based on electricity (for example, all-electric or hybrid vehicles), compressed air, or fuel cells (i.e. hydrogen fuel cells). Petro-cars, this is, only use petroleum and biofuels (biodiesel and biobutanol). Hybrid vehicle and plug-in hybrids, that use petroleum and other source, generally, electricity. The Hubbert peak theory (also known as peak oil) is a proposition which predicts that future world petroleum production must inevitably reach a peak and then decline at a similar rate to the rate of increase before the peak as these reserves are exhausted. It also suggests a method to calculate mathematically the timing of this peak, based on past production rates, past discovery rates, and proven oil reserves. Controversy surrounds the theory for numerous reasons. Past predictions regarding the timing of the global peak have failed, causing a number of observers to disregard the theory. Further, predictions regarding the timing of the peak are highly dependent on the past production and discovery data used in the calculation. Proponents of peak oil theory also refer as an example of their theory, that when any given oil well produces oil in similar volumes to the amount of water used to obtain the oil, it tends to produce less oil afterwards, leading to the relatively quick exhaustion and/or commercial inviability of the well in question. The issue can be considered from the point of view of individual regions or of the world as a whole. Hubbert's prediction for when US oil production would peak turned out to be correct, and after this occurred in 1971 - causing the US to lose its excess production capacity - OPEC was finally able to manipulate oil prices, which led to the 1973 oil crisis. Since then, most other countries have also peaked: the United Kingdom's North Sea, for example in the late 1990s. China has confirmed that two of its largest producing regions are in decline, and Mexico's national oil company, Pemex, has announced that Cantarell Field, one of the world's largest offshore fields, was expected to peak in 2006, and then decline 14 percent per annum. It is difficult to predict the oil peak in any given region (due to the lack of transparency in accounting of global oil reserves) Based on available production data, proponents have previously (and incorrectly) predicted the peak for the world to be in years 1989, 1995, or 1995-2000. Some of these predictions date from before the recession of the early 1980s, and the consequent reduction in global consumption, the effect of which was to delay the date of any peak by several years. A new prediction by Goldman Sachs picks 2007 for oil and some time later for natural gas. Just as the 1971 U.S. peak in oil production was only clearly recognized after the fact, a peak in world production will be difficult to discern until production clearly drops off. Many proponents of the Hubbert peak theory expound the belief that the production peak is imminent, for various reasons. The year 2005 saw a dramatic fall in announced new oil projects coming to production from 2008 onwards - in order to avoid the peak, these new projects would have to not only make up for the depletion of current fields, but increase total production annually to meet increasing demand. The year 2005 also saw substantial increases in oil prices stemming from a number of circumstances, including war and political instability. Oil prices rose to new highs. Analysts such as Kenneth Deffeyes  argue that these price increases indicate a general lack of spare capacity, and the price fluctuations can be interpreted as a sign that peak oil is imminent. Oil consumption per capita (darker colors represent more consumption). There are two main ways to measure the petroleum efficiency of countries: by population or by GDP (gross domestic product). This metric is important in the global debate over oil consumption/energy consumption/climate change because it takes social and economic considerations into account when scoring countries on their oil consumption/energy consumption/climate change goals. Nations such as China and India with large populations tend to promote the use of population based metrics, while nations with large economies such as the United States would tend to promote the GDP based metric. population compared with its large oil refining capacity. Source: Energy Statistics from the U.S. Government. For oil reserves by country, see Oil reserves by country. 3 Canada has the world's second largest oil reserves when tar sands are included, and is the leading source of U.S. imports, averaging 1.7 MMbbl/d in April 2006 . Note that the USA consumes almost all of its own production, while the UK has recently become a net-importer rather than net-exporter. See also: Organization of Petroleum Exporting Countries. ↑ "Crude oil is made into different fuels". Energy Kids Page. Retrieved August 25, 2007. ↑ EIA reserves estimates. Energy Information Administration. Retrieved August 25, 2007. ↑ CERA report on total world oil. CERA. Retrieved August 25, 2007. ↑ WebMOHeat of Combustion of Fuels.Classroom-tested WebMO Exercises. Retrieved August 25, 2007. ↑ Petroleum Study. DOE "Technical and Scientific Information" Bridge. Retrieved August 25, 2007. ↑ Shell Middle Distillate Synthesis Malaysia. Shell Oil. Retrieved August 25, 2007. ↑ Sasol corporate website. Retrieved August 25, 2007. ↑ Encyclopedia Britannica, (1911 ed.) "Petroleum." ↑ Kasem Ajram. The Miracle of Islam Science. (Lincolnshire, IL: Knowledge House Publishers, 1992. ISBN 0911119434). ↑ Pechelbronn History of Pechelbronn oil. The Oil Museum. Retrieved August 25, 2007. ↑ Stanislave Patin. Waste discharges during the offshore oil and gas activity. Offshore-environment.com. Retrieved August 25, 2007. ↑ New study raises doubts about Saudi oil reserves. (March 31, 2004) Institute for the Analysis of Global Security (IAGS). Retrieved August 25, 2007. ↑ Kenneth Deffeyes. Beyond Oil: The View from Hubbert's Peak. New York, NY: Hill and Wang, 2005. ISBN 080902957X. OTS Heavy Oil Science Centre (includes overview of all phases of the oil industry). Waste discharges during the offshore oil and gas activity - Environmental effects of oil extraction. Bloomberg Energy Prices - current prices on world mercantile exchanges. Oil Marketer - oil news and market information. Oil in troubled waters - The Economist article on investor approaches to oil markets, supply, and future. Department of Energy EIA - World supply and consumption. Department of Energy EIA - Crude Oil and Total Petroleum Imports to USA.